The flowplus16 pressure sensor from Intertronics offers high accuracy monitoring in an innovative design suited to critical dosing and dispensing applications. Accurate in-line pressure sensing can deliver important quality assurance in a whole range of automatic processes; for example, in medical, pharmaceutical and semi-conductor manufacturing, as well as the wider areas of process control. The flowplus16 is compact and is easily installed into the fluid path by means of standard luer lock fittings. It measures the pressure of the liquid being dispensed or dosed, and provides precise monitoring of material flow. This information is useful in many analytical and laboratory situations, but also has real value in production environments where, for example, it can detect irregularities caused by air bubbles in adhesives which would disrupt tight tolerance dispensing on medical devices or visual displays, or identify a blockage building up in filled fluids, so enabling corrective action to be taken. 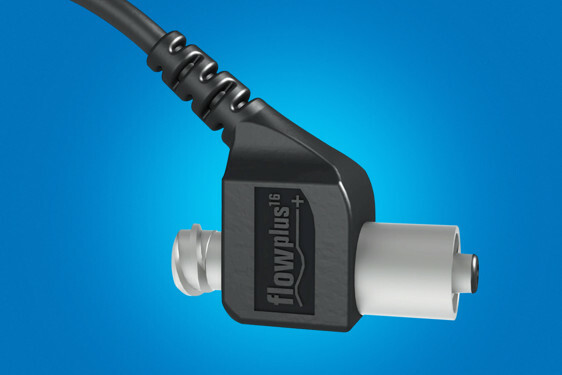 The flowplus16 is one of the smallest piezo-resistive pressure sensors available and is maintenance free, featuring an inert fluoropolymer internal coating which provides a smooth and consistent fluid pathway with no internal dead space. The compact unit incorporates an integrated micro-chip which converts the pressure sensing to a standardised 0-10V digital output signal. Any detected pressure fluctuations enable problems to be identified at an early stage, e.g. clogging, micro-bubbles or variable pressure feed. Constant readout via a standard connector provides verification of correct dosing or dispensing and may be simply integrated into existing PLC control systems providing temperature compensated readings, without complicated calibration, in a user friendly package.